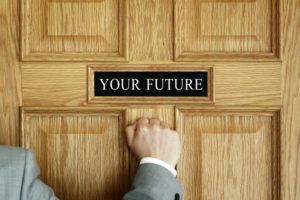 You are here: Home / career change / Do I need a CV or a resume for a nonclinical job? Krista Grant, lead physician recruiter at Wake Forest Baptist Health, used the above scenario to describe what it can feel like for physicians applying to nonclinical jobs. She said a common reason for the rejection is that the doctor used a CV to apply for a job when a resume would have been a more effective calling card. Since she recruits for both clinical and nonclinical positions, Ms. Grant is very familiar with both CVs and resumes. In this blog, I’m going to show you why a resume is preferred for most nonclinical jobs and give you some key tips for converting your CV to a resume. Unlike the CV, which is a chronological accounting of your complete professional history, the resume prioritizes information relevant to a specific job with the goal of showing how your qualifications and experience make you a great candidate. Ms. Grant said that while a CV may work for some nonclinical jobs, a well-written resume makes it easier for the gatekeepers and decision-makers to quickly understand why you are a good fit for the job. 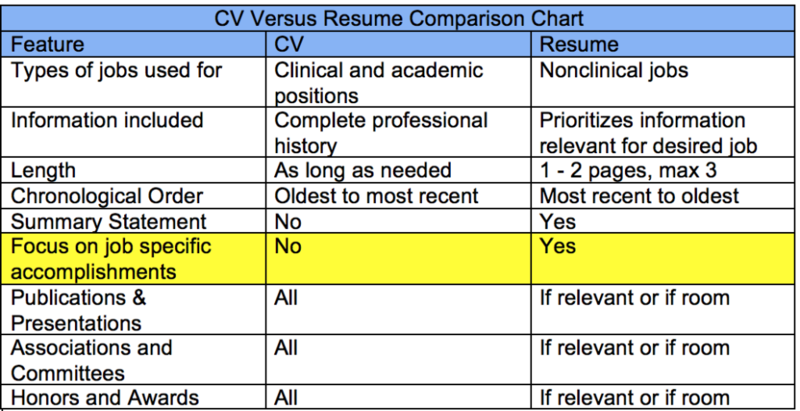 This table highlights the general differences between the CV and resume. The purpose of the resume is to get an interview. Short of actually writing that, or having some kind of pop-up bribe on your resume, how do you grab the recruiter’s attention with this mini-skirt length document? You show some leg! Well, resume kind of leg. Ms. Grant said she reviews more than 1,000 CVs/resumes a year and her eyes perk up whenever she sees one with a little color and a nice template. She recommends Pinterest as a place to find inexpensive templates, citing that she paid $15 for hers. You can find templates here and here. Once you have selected a good-looking template, you want to work on the heart of your resume which is in the Professional Experience Section. In this section, you use bullet points to describe your job duties and accomplishments and show how you have made a measurable, positive impact in your position. You did X in X period of time resulting in X (quantify your results). If you can explain how, even better. Now, probably some of you are thinking, I “just” see patients. I don’t have specific job-related accomplishments, and certainly nothing I can quantify. A good number of entry-level non-clinical jobs do not expect you to have statistics. But hiring authorities do want to know how your experience matches the job. A good place to begin is to print off several job descriptions of interest. Start listing the skills and duties desired by the company. Think about how you use these skills in your current job and create bullet points to capture this experience. You also want to match as many keywords from the job description on your resume as are relevant for you. For example, if the job description mentions utilization management, level-of-care, and evidence-based medicine, you want these on your resume as the recruiter will be looking for them. After you have matched the content on your resume as much as possible to the job description, creating a Summary statement is a great way to let the reader know in 3 – 4 sentences who you are and why you are a good fit for the job. Summary statements have replaced the Objective statement. I recommend talking to physicians in the type of position you desire to see what additional experience you may need and what steps to take. Recruiters can also be helpful here. Having a working draft of your resume will avoid scrambling when that coveted job appears. You will be ahead of the game, with more time to prepare for the interview. I want that door to open for you! Which reminds me, the next blog in this three-part series is on…you guessed it… Interview Prep. A very special “Thank you” to Krista Grant for her most helpful contributions to this post. Thanks so much, Joel! Good to hear from you. I hope things are going well.